5PM: Were you encouraged by what you saw at the University level on Friday? Coach Matt Lindland: Yeah, our guys who are wrestling Greco Roman are improving. Period. That’s evident by the way they performed and I can see that by watching them compete. They are getting better in all areas, on the feet, on their par terre top and bottom. The unfortunate part is that we are going to keep separating ourselves from the folkstyle guys and it’s already at the point where it’s hard enough to get these guys to come over and compete in Greco. But you see wrestlers like a freshman, Jesse Porter at 75 kilos, making the finals and make the team. 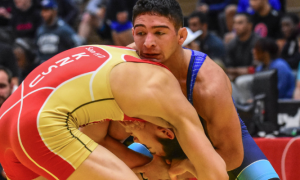 He’s a true freshman but he’s in a purely Greco environment. 5PM: The overwhelming dominance by the Northern Michigan program yet again in this tournament on Friday is evidence it’s working. There is a difference that kind of jumps out on you when you’re watching these kids perform in terms of competitive ability and savvy when compared to many of the “freelancers”, lack of a better term, who usually enter this tournament. ML: There’s a much deeper understanding of what we’re doing and what it takes to be successful in Greco Roman wrestling. I wouldn’t say entirely, but they’re closer than these “freelancers”, as you put it. You know, I call them “ten percenters”, to tell you the truth. Because back in the American Revolution, there was only three percent who actually fought but there was ten percent who supported the cause. And I would definitely say I’m happy to see guys like Kade (Moss) and Trey (Andrews) and all these guys, because they are very good wrestlers. And some of them I think are potentially better Greco Roman wrestlers than they are freestyle or folkstyle wrestlers. Unfortunately, they’re just not in the right system. 5PM: That’s an interesting slant to take because there were certainly a few athletes not from Northern Michigan who had very good tournaments, as well. Although it’s great and we want NMU to be built up, it must also be encouraging that there are other wrestlers around the country who have potential, want to compete but yet, train somewhere else. ML: I definitely think that’s a positive sign. But a fear of mine, I shouldn’t say it’s a “fear”, it’s the system, but the unfortunate part of that system is that we’re maybe not going to get the “blue chip” wrestlers. The guys who were maybe really good in high school and possibly made some Cadet or Junior teams, we’re not going to see them continue down that path. Look at Beasley and Reyes, who are phenomenal Greco guys. They used their Greco skills to win them some matches in freestyle. Nikko made it to the finals and I think Beasley lost in the semis. But those type of athletes. We saw guys like Sammy Brooks, Burke Paddock, both make it to the finals and both of them have been on Greco teams, won Fargo in Greco. Ethan Anderson, Wyatt Koelling, these are guys who have made teams before and is that train going to continue? 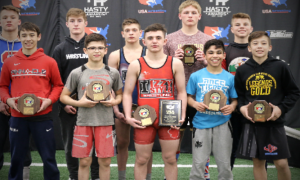 Because now they are going to go somewhere where they are not immersed in Greco and they are potentially starting either freestyle or not even Greco in March, and then they are going to try and be prepared by early June to try to make a World Team and compete at the international level? I mean, it’s one thing to make a team, but if you haven’t been training it’s going to be hard to be prepared to go compete at a World Championship-level event training a couple of months out of the year. So yes, to answer your question, there are encouraging things. 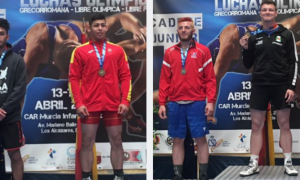 There are also some things I am just bummed about because I’m seeing some of our best young Greco athletes leaving the system and going into a completely different system. It’s not even like their club program where I know a lot of these athletes and what they’re training, how much they are training at the clubs. Then once they get to college, they are not going to be able to train that much in the international style. 5PM: So it is equally frustrating on one hand and encouraging on the other. 5PM: You saw the Dalton Roberts versus Alan Waters match that brought on a bit of controversy, though the controversy is questionable in my book if you understand the rules, the style and the way matches are wrestled. ML: I got to tell you, I was bouncing between the University age group and the Cadets both. I was trying to keep my eye on both events at the same time, so I’m obviously not going to see every single match. But that one, there was enough chatter on Twitter on Friday that made me really want to go see that match and see what happened, because if I just went by the report I was reading, I would have thought that somehow Waters really got screwed in this match. And quite frankly, he is a phenomenal wrestler and he didn’t get screwed. But he doesn’t understand the sport and he doesn’t understand the rules, too. I thought the referees did a pretty good job of making it clear to him that, One more caution, I’m going to have to caution you out of this match. I’ve cautioned you twice, the third caution you’re going to be out of this match. Now, that’s the same in freestyle, three cautions and you’re out. But the headbutts? You know, he’s an aggressive wrestler, I get that, it’s part of the sport. I don’t think it was flagrant to where he could have been disqualified, personally. But he certainly could have been cautioned earlier for the headbutts he was doing. He jumped on the whistle twice on par terre. That was a mistake, that was a tactical mistake. This is a different sport than he was used to wrestling. He just wrestled freestyle where you could avoid action, you could run away if you got a lead. The goal in folkstyle, it seems to me, is to run away from wrestling and avoid contact. That is impossible to do in our sport with the rule-set. You can’t avoid action because it is immediately fleeing the hold, it’s two and a caution. So I thought it was a good match, an interesting match. People should go watch it and maybe learn something from that match, especially if they are going to continue to wrestle Greco. 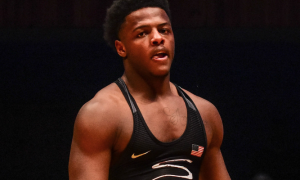 I would love to see Waters continue down that path and maybe we can get him to come in and do some training and potentially pursue some Greco Roman. 5PM: Do you like to see a wrestler like Roberts commit to his strategy? He basically won by trying to impose his will and pushing the entire time despite getting scored on. It seems like that says something about him as an athlete. Coach Matt Lindland: I think that’s an incredible attribute as an athlete, that you can develop a game plan, whether on your own or with your coaches, and go out there and execute it. That’s what the sport is about. You come up with a plan, a strategy, and you have to execute your will over an opponent that is trying to do something entirely different than you. So yeah, I thought that was impressive. He is absolutely on the right track. I would be shocked if he doesn’t win a medal this year at the World Championships. And the other piece I think we failed to mention is that Dalton went up a weight class to 59 kilos. He’s not even a big 55 kilo guy yet. He’s still growing. I think he has a lot of growth ahead of him still in the sport. He can put on muscle. But we’ve seen him improve a lot in one year. We’ve seen him grow and develop physically with the strength program at Northern Michigan, so he’s doing all the right things. He’s very diligent in his preparation. I know last year at training camp, Coach Halvorson gave each of the Junior athletes a heart rate monitor and a protocol for training when he didn’t have them in camp. He said, “This is the phase I want you to work on your base, this is the phase I want you to work on this other energy system”, which is maybe our threshold or lactate threshold system and might involve more sprints and stuff. But he told them, “Go ahead, take these monitors, track it, and send me the results.” And Dalton was only one of two athletes who was diligent enough to send Marc every report from all of his training sessions. So we didn’t have to guess whether he was doing the work, he actually showed us. 5PM: It’s funny, I forget how young he is. ML: He’s 18. 18. Tim, he’s 18 years old. 5PM: Every time I hear he is 18, I just don’t believe it. I know it, but I don’t believe it. ML: But I think this goes to show that when you have a good athlete and you put him in the right system, it’s going to work! It’s going to work if they do the work. If the athlete doesn’t do the work, the system and the plan aren’t going to. Yeah, we were talking about Roberts developing a plan and executing it, I think that is what we’re doing as a program. We’re developing a plan and we’re trying to execute that plan. But there are a lot of people involved. It’s not just me. Each one of the athletes has to execute their own individual plan along with that, so it’s a big process. 5PM: You specifically mentioned last week how you expected Patrick Martinez and Tracy to have strong tournaments and they both did. Martinez wanted Zillmer, of course. But when you watch a few of your more accomplished athletes in a tournament like that where the competition isn’t quite the same, is there anything you’re looking out for from a technical standpoint, what they might be working on in the room and to see them employ it? An approach? Or is it just a matter of them running wild at the Universities? 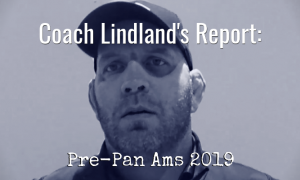 Coach Matt Lindland: Well, I think for our Junior athletes who were already on the World Team and in college, college-aged wrestlers, it was a piece of their training plan and developmental process. For the Senior athletes still in college or taking classes towards a degree, I think the biggest thing was to go through the process and get on the team. I mean, certainly to go out there and work on your skills. But it does make it harder when you are wrestling athletes who wrestle almost a completely different style. I remember when I was a Senior athlete, I had to wrestle one way with American officials and against my American counterparts, one way there. And then I had to change my style when I wrestled international matches. So it is difficult, because I don’t think the American officials are as quick to call the blocking, the head down, the passivities, as the European officials are. And I think it’s more apparent when we were wrestling guys who were blocking and running away from action and avoiding contact. ML: I wouldn’t even call it “pretend”, I would say “mindfully active.” You’re making attempts but you’re not putting yourself at risk. 5PM: Better put. Okay, you also checked out the Cadets. What did you see out of the Cadets that you liked? Were there any individual performances that kind of stood out to you? ML: I’ll tell you what I like, and that is we have so much talent in this country at that age group. That’s what I like. The part that I’m a little fearful of is we’re going to see all of these fantastic athletes matriculate into the college system. I saw a couple of guys that surprised me. I expected Jake Allar to be in the finals. 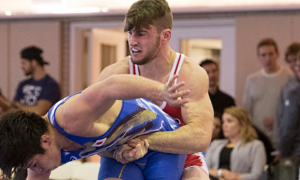 There were three athletes in particular who are phenomenal Greco wrestlers who I am going to hate to see leave the Greco path and go off into college. One is Allar. I’m very close to him and his family and I just like him as an individual, but I also like him as a Greco wrestler. I’m going to hate to lose him to the folkstyle system. But I’m optimistic we’ll get him back, so I don’t want to totally count that out. But I do know he has aspirations to get a degree and that’s important stuff, too. And Northern Michigan doesn’t offer the degree he is looking for, he wants to be an engineer. The other athlete was Alex Thomsen from Iowa. I was a little surprised he lost, but he came back to get the bronze medal. And then there was Alston Nutter. He I was surprised about because he is a full-time Greco guy who made a commitment to move up to Northern Michigan next year and finish his high school education in Marquette while he’s immersing himself in Greco. I guess I was surprised, but each one of them had reasons, not excuses. Alston had a nasty, nasty staph infection and he possibly shouldn’t have even been on the mat, he was so sick. So that definitely affected his performance. Jake is really taking a look at college wrestling so he was spending more time studying freestyle than he had in the past when he was solely immersed in Greco. Folkstyle, freestyle, I think not training as much in Greco as he did a year ago hurt him. And I think for Thomsen, he’s just bouncing between all of the styles, as well. I think that’s a problem. When I had him out here training for two weeks in Greco, I had never seen a kid improve so fast in such a short period of time. 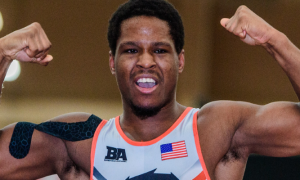 But when he went back to Iowa, he was preparing for both Greco and freestyle, and that was apparent after his tournament when he entered freestyle, also. So I think if you are splitting your time, it’s hard to be great at one. And all three of those athletes were guys I was kind of expecting to potentially be on our team and all three of them are great wrestlers. But they are kind of bouncing between styles and it’s unfortunate. I don’t know which style is going to win but if I had to guess, I’d say it would be the folkstyle. 5PM: Same old story, huh? ML: Same old story. But as far as impressive Cadets, there was a lot of them there, there was a ton of impressive Cadets up and down the weight classes. Schultz was very impressive in his approach. And he is another one of those athletes where a couple of weeks ago he was wrestling folkstyle and then after the Greco, he was wrestling freestyle. I hope between now and the World Championships though he is going to totally concentrate on Greco and get prepared, which I’m confident he will. I feel pretty confident about that decision. 5PM: Did you catch the kid from Kansas, Clay Lautt? ML: You know what, I did, I did. Actually the first time I saw him was a couple of weeks ago in Concord, California, he did very well in the Concord Cup, the international tournament out there. He was training international matches so I’m happy he made the effort to get out and wrestle international matches in Concord because that will give him some experience going into the World Championships. He stuck around, competed, and participated in the training camp out there. So yeah, he was a big surprise to me, but I got to see him a couple weeks back. 5PM: Well, his opponent in the finals was no push-over, Accosta from Wisconsin, he’s a really tough kid, too. ML: He’s very tough, that was who I thought. Especially after he took Allar out. Because I know the system he trains in and he’s training Greco and I know his coaches. Lautt, I’m not sure where he trains or who is training Greco with him. But I do know they were serious enough to get him out to California for an international Greco tournament. I think that helped. And I can assure you that next year, Wisconsin will have a team in Concord. Coach Matt Lindland: On no, they will, they were already talking to Coach Halvorson so they could make sure that is on their schedule. 5PM: They’ve certainly got the horses for it. ML: They do, Wisconsin has so many Greco guys. Look at our Olympic team. Half the team is from Wisconsin. 5PM: All in all, you left Akron encouraged? ML: I left Akron very encouraged with the level of talent we have and optimistic that we can persuade some of these athletes to continue down the Greco path beyond just maybe the World Championships. 5PM: Speaking of that, what happens next in terms of training for the University and Cadet World Team members? ML: I know a lot of the guys were scheduled to be up in Marquette this week for camp, which starts tomorrow morning. I know our entire Junior team is up there and I think a lot of the Cadet team members were planning on attending and are already scheduled to be up there. That’s a piece of the training. The other piece is that they just need to get a hold of the coaching staff and let us know their schedules so we can get them out to Colorado to train when it’s available. But this being an Olympic year, there are not a lot of opportunities to bring them out here because we’re going to be gone for the next three weeks. Our Cadet coach, Shawn Sheldon, is working on maybe getting some guys here individually to work with him. And then at the end of July we do have a combined Cadet and Junior World Team training camp, which will be the 24th till the 31st. 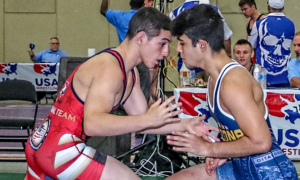 It’s far enough out from the World Championships for the Juniors and way far out for the Cadets, but it is an opportunity for our coaches to get with our athletes and find out which deficiencies we can help them improve on, and put a plan together in July. We train them for a week and then give it to them, Here’s our training plan. So that will really be our first time seeing them and where they’re at, and then talk to them about their plan and help them execute that training plan between now and the World Championships. The Junior plan is set, that’s all coming together. Honestly, we’ve had more access to this Junior team than any in the past, ever. Two of them live here in Colorado Springs Three of them live in Marquette, so they are full-time Greco Roman athletes. The guys who live in Marquette have come down here for camps, everybody is getting together this week up at Superior (Camp). Some of the athletes, Tracy, Cohlton, Lautt, and Peyton (Omania) were out there in Concord. So honestly, we are getting the Juniors and Cadets training together. And a lot of the Cadets were at Concord, they made that team, so that should tell you something right there. So let’s see. Peyton, Lautt, Tracy, Schultz, those four right there and I might be missing somebody, but those four athletes were out at that training camp in Concord, which was preparation and a tournament to help get them ready for the Universities. You know, the plans we are putting in place if the athletes are capable of executing them. Sometimes, it’s school. They can’t miss school, they can’t get out of class. But the athletes who are able to make the sacrifices and execute these plans that were put in place, it’s working. And I’m super-encouraged by that. There’s also the kid who is from Colorado, I know who he is and I’ve seen him in our room but not very frequently, Mosha Schwartz. That kid’s got a lot of talent. I was just super-impressed by him and what he was capable of doing. I’m also looking forward to working with that 85 kilo athlete from Illinois, Jacob Warner. So yeah, I think this is a darn good team. 5PM: Yeah, watching many of these wrestlers over the weekend, they don’t look like Cadets, they don’t wrestle like Cadets. But it’s a different generation. ML: It is, it is. These guys are so much better than I dreamed of being back at that age. I guess that’s the hard part for me. I see so much talent and I am just fearful they are all going to leave and go wrestle folkstyle. And once that happens, I don’t know if I see them again or not. But you know, maybe it’s always been this way. Maybe there has always been this much talent. I don’t know. I have been watching a lot closer the last couple of years since I’ve been on this job and I was watching this weekend. The Cadet/University tournament was my two-year anniversary of being on the job. That was my first day on the job two years ago, attending that event. I’ll tell you what John Smith said to me when I started, he said, “Congratulations and I’ve got an athlete for you in two years.” I was like, Oh okay, great. Two years later, that kid is on the freestyle National Team (laughs). 5PM: You’re less than a week out from leaving for Baku. Do you have a finalized roster of who is going? ML: I do. It is Jesse Thielke, RaVaughn Perkins, Andy Bisek, Geordan Speiller, Ben Provisor, Joe Rau, Tracy Hancock, and Robby Smith. And Nick Tarpley, who was a Junior last year, will be meeting us out there. 5PM: You mentioned that you guys know how the Azerbaijani team runs their program, and you are comfortable with it. Do you already know what the curriculum is going to involve pretty much? Coach Matt Lindland: Other than a lot of wrestling? No, I do not (laughs). I haven’t seen the plan yet and I probably won’t until I get there and we talk about it together. But we’ll get there, we will get the guys settled the day we get in and then rest. Then the next day we’ll start up with the team training. But I’ll go over it all with them. And like I said, I know we discussed this in the past, what this camp is going to entail, but I haven’t seen the daily workout schedule, no. 5PM: How are your Olympians doing as far as their conditioning progress and overall health? ML: I think my only concern was that when I was traveling to Akron, I was trying to get Ben (Provisor) into seeing a doctor because he was under the weather and I wanted to get him healthy before we left. But yeah, everyone is healthy. There’s no injuries with any of our athletes and we’re just finishing up our last week here of our base training and we’re going to have a solid base going into his camp, so I’m comfortable with that. We’re going to get a chance to work our higher-end threshold training system for three weeks and get in a lot of good wrestling, the feel of wrestling international opponents and training partners. So I think that most importantly, that is what it’s going to take. We don’t have the depth of the freestyle team here in the United States where they bring in their National Team and they have enough depth. One weight class alone they have an Olympic and World Champion, you know? We don’t have that luxury right now but we’re building and we’ll get there. 5PM: We’ve talked about some of the sports science elements involved in training the wrestlers, but what I want to know is your approach to peaking. What is that process in regards to Rio? How do you build up and how do you recover enough to be, in essence, “peaked” for competition, which begins for the guys is the 14th and 15th? I think it’s an interesting topic readers may want to know regarding the Olympians. It’s almost a mysterious thing. ML: Technically, if you look at my yearly plan, there were two peaks. One was at our Trials and that was a mini-peak, to tell you the truth, where we did taper the guys a little bit and then we rested and recovered them after competition. And now we’re back. We’ve kind of started all over with a lull and we are back up with the volume pretty high right now. The volume will cut back and the intensity will go up. And then when we get back, I am going to rest the guys and recover them pretty hard, let them heal up from any of the hard training sessions that we’ve had. Just rest them well and get them recovered. And then as we get back here in July, we start our camp back up on the 11th, we have two solid weeks from then until the 22nd. And then on the 23rd we go into processing, when I am really going to shorten our training up even more then it will be in June while we’re in Baku. But really, just short, hard quick go’s. We’ll deal with with a couple of days of high intensity but low volume, where I’m talking 12 minutes of live and 14 minutes of work, so 26 minutes of work, 12 minutes of that being live wrestling. And you know, those will be the type of training sessions we’ll be doing in July. So super high intensity. 26 minutes of total work and 12 minutes of it being live. So we’ll have that kind of training. And then when we’re back and go to processing on the 23rd, I’ll come back while our Juniors are here training and my Olympic Team will be recovering that week. Still working, but very low intensity, low volume. On the mat, probably three times that week and then we will start our final taper training camp, which is what I guess I’d call it, from the first of August to the 9th and we travel on the 10th. We’ll arrive on the 11th in the morning, we will have that whole day. We’ll have the whole day on the 12th and the 13th, so that will give us our three days of acclimation to the time zone change. And then like you said, 59 and 75 kilos will compete on the 14th and then Robby and Ben will compete on the 15th. 5PM: Is this similar to what you went through in 2000? ML: To be frank, I really don’t remember exactly. As an athlete, one of the luxuries you have is that you don’t have to think (laughs). You could just discuss your plan with the coaching staff and let them run you through it. You just get to do the training. To tell you the truth, I really don’t remember. I remember bits and pieces of my plan. Because when I trained here or trained back at my home in Lincoln, Nebraska and Mark Cody was running the training sessions for me, it was a plan I worked on between the National coaches, Mark, and myself. But by the time I’d hand it over to those guys I was like, I’m done here. Here’s the plan. I’ll do the work, but you guys run me through this. But this comes from a little bit of that I guess, Momir’s wisdom, and the sports science department at the USOC, taking information from everybody who’s a stake holder. Marc Halvorson has a lot of knowledge in this area, he studies it a lot. Chris Saba in 2000, I would consider him more of a coach after he didn’t make the team, and he was I guess my training partner, but he was as much a coach at that point in his career because he just missed making the team with me and Kevin (Bracken). So I kind of let him run the last part once we got to Australia and help me out with that. I’ve got both of those guys on our staff this year as volunteer coaches with Momir. And we’ve all had many, many conversations over time and made little adjustments and changes as the year has progressed. But it’s pretty much the plan we talked about in the fall that we said, Here’s what we want to do, here’s what we want to accomplish, and here’s the two times we want to peak, and we’ve already got past that first mini-peak at the Trials and we’re now in the in the hard training phase as we head into the final two months.